I’m not sure if it’s just me, but my spice cabinet remains in a state of disarray no matter how hard I try to keep things at least standing up. It’s some kind of curse to have various sized jars and bottles that don’t stack right, fall over and sometimes avalanche when the door is opened. Ha!! Please tell me I’m not alone?! 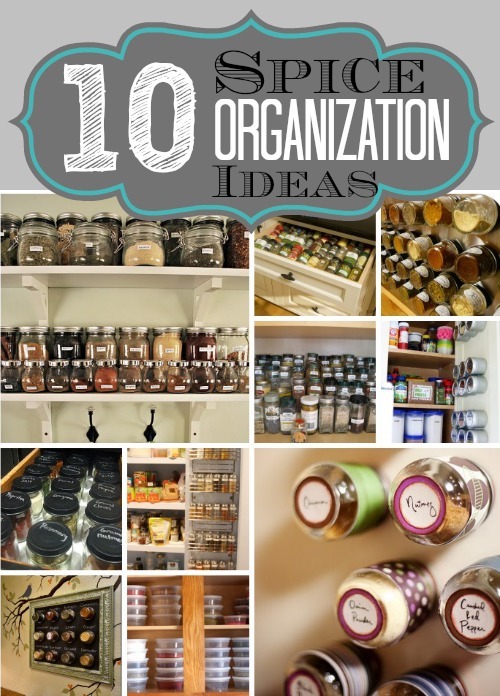 I’ve rounded up ten spice organization ideas for y’all! Some of the ideas are similar, but there are unique qualities about each one. 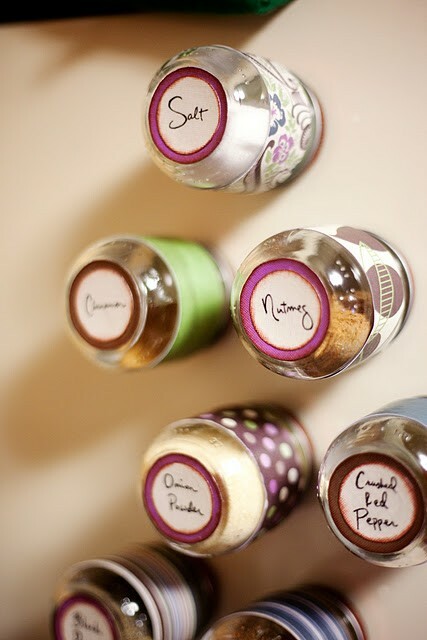 How adorable are these repurposed baby food jars used as spice jars on the refrigerator?! Love them! Jelly jars stored on a piece of sheet metal…cool stuff! 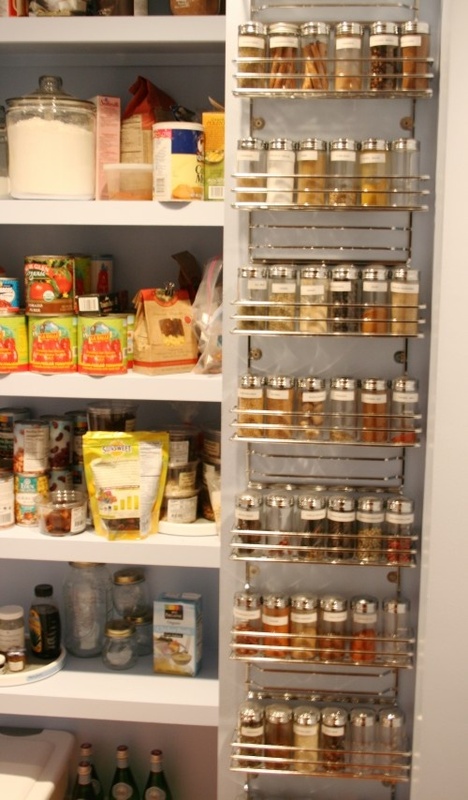 If you have a pantry door near your cooking zone, then this door spice organizer would be perfect. I’m pretty much in love with this spice drawer. What’s better than a little chalkboard paint? 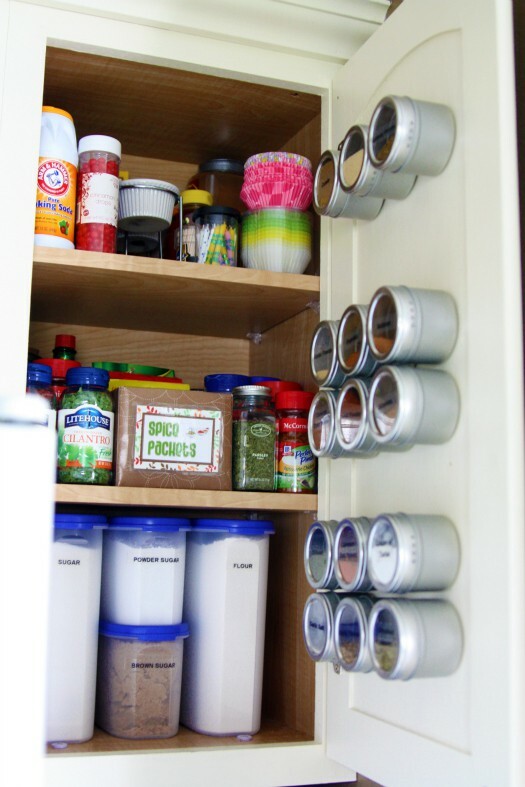 You could store your spices inside your kitchen cabinet door with magnetic paint. Another spice drawer with risers to separate the spices. Or you can use risers in a cabinet…along with handy labels. Oooo, la, la! 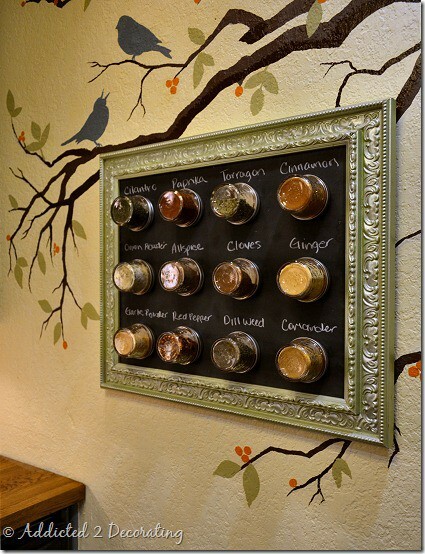 I love this option – a framed, magnetic chalkboard with spice jars. So pretty! 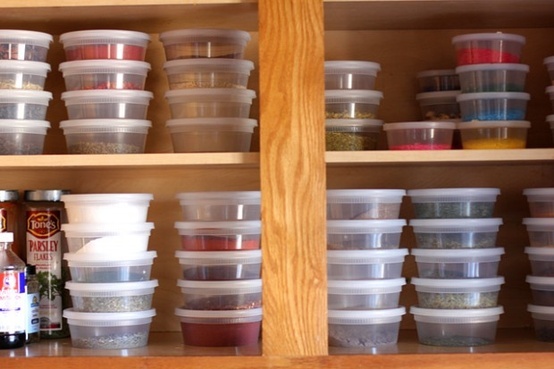 If you’re craving uniformity in your spice cabinet, then maybe clear, stackable, plastic containers are the perfect solution. How do YOU organize your spices?? Tell me what works! 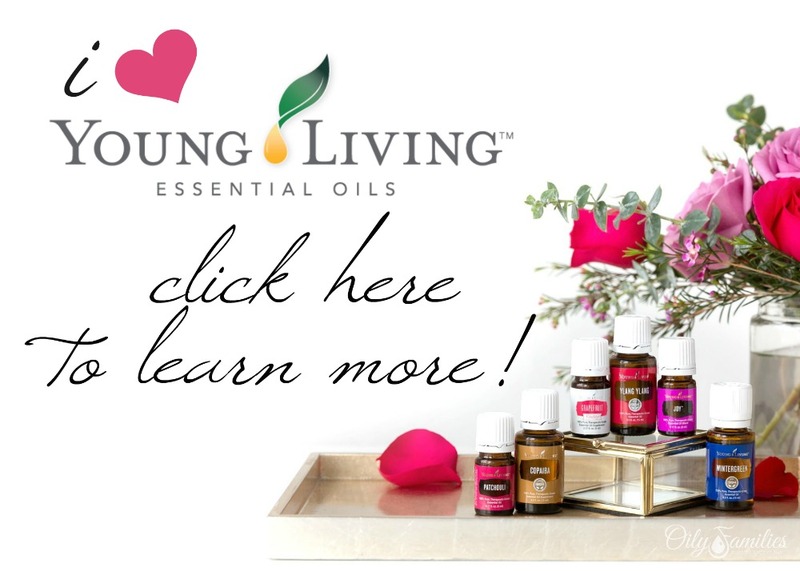 I’m linking up to Today’s Creative Blog and Organizing Made Fun! I need to organize my spices! Great ideas girl!! 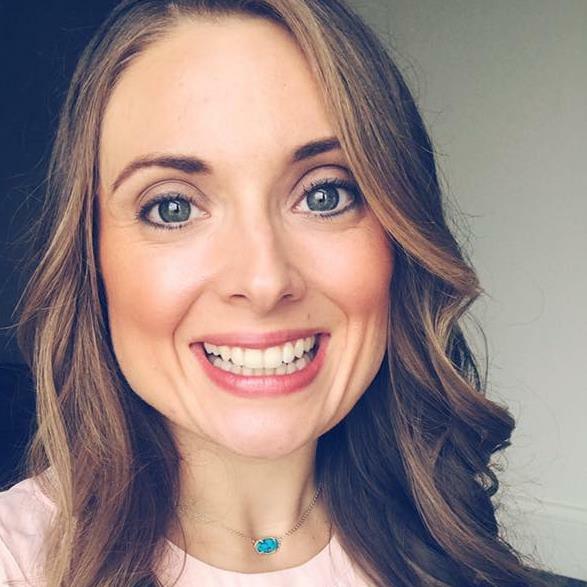 Cyndi Spivey´s last blog post ..The Chambray Shirt is a Must Have! I’m also very much in need of organizing my spices. I’ve got some ideas I’m going to work on. Great post! 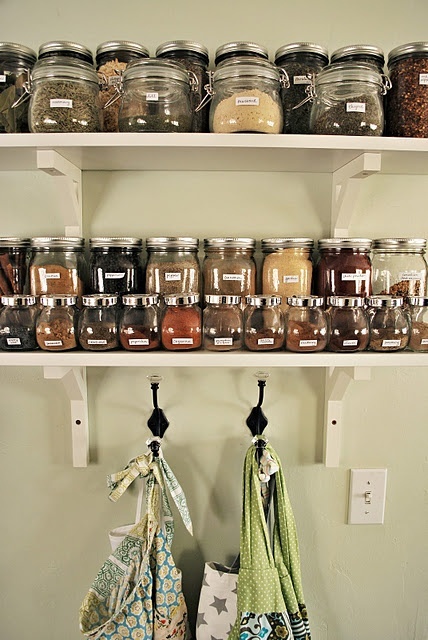 We have a couple of ways – a lazy Susan spice loft (with sliding ladder and cook book library) and labeled jars displayed on a chunky pantry type piece of furniture and of course some in the cabinets (my husband does the cooking and loves a variety of spices). 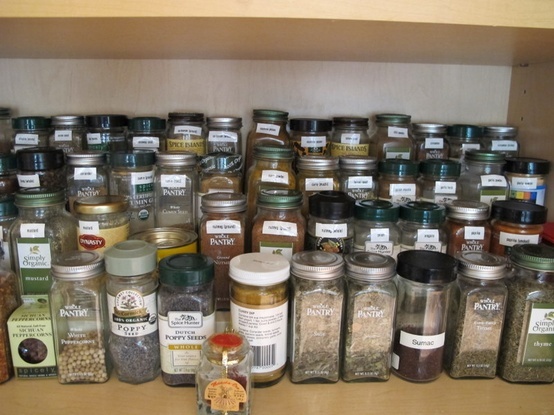 I use lots of spices in my cooking… have a whole shelf of them, in fact. When we moved in, I tried using some risers in the cabinet but found I couldn’t fit them all in anymore! So I made up a cute little chart of what’s where and stuck it on the inside of the cabinet door. Now I can reach blindly and know exactly which one I’m picking up! I’ve also left the spices in their original containers, so they’ll each feel different from the others. These are great ideas. 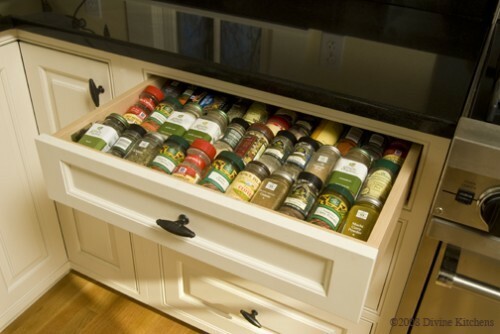 I’m tackeling one organization project a month this year, this could be very helpful for when I organize the spice drawer! I have one of those over the door pocket organizers for shoes. It hangs on the inside of my pantry door. 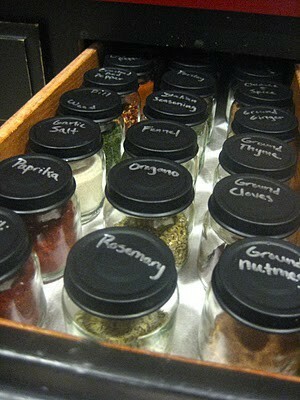 It works for me because I have various sized spice jars & because it is clear you can see the labels. LOVE this post! I have a ton of new spices from Penzeys and I need to figure out how I want to store them. Great ideas. My spices are always a total mess. I like the idea of the clear plastic stackable containers for the spices. LOVE the simplicity of the ikea containers. 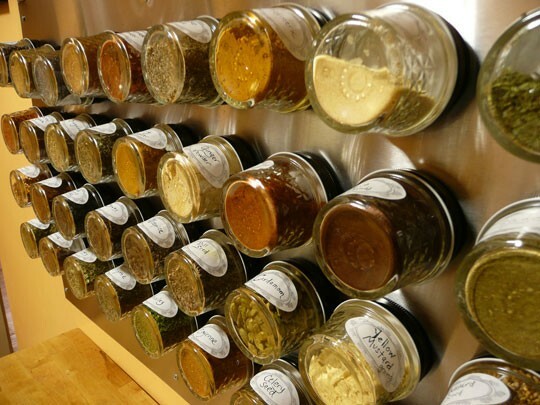 We can finally figure a way to organize the 30+ spices in our kitchen. You are not alone. I could use a revamping of my spices and my baking supplies. These are some wonderful ideas. Thank you for the inspiration. Love these – they have just inspired me! I usually go for quick and functional organizing (it’s one of my mantra’s) BUT I love gorgeous things especially gorgeous storage and organizational stuff. Now, just have to find time to do this! In the past when I used spice jars that came with a spice rack it seemed like the spices didn’t last as long as they do in their original containers… I was just wondering if anyone else had this problem? When we started designing our new house, I knew I wanted a spice drawer right below my cooktop. I opted to save money by using tension rods to divide the rows instead of custom inserts. I use a divided coke crate. Actually I have 2. One is for the shorter spices which I am trying to convert all of mine to. The other is the taller spices on their side. I still need to label the ones on the their sides better so I won’t have to go through several before I find the one I need. I do have them in alphabetical order to help. The stuff you are showing in this post is really good and made with great ideas. the designs are also good. Great ideas dear. I love all of your creative ideas . I think this spice rack will be adjustable for my kitchen. Very nice ideas! Definitely going to follow one of these! I think it’s time to do some setup here in our house. Thank you for sharing this.